(June 16th. 2012)Newton, NC -- Side-by-side racing resonated through the night at Hickory Motor Speedway with the Late Model and Limited Late Model drivers battling until the very end. Keith Bumgarner and Travis Byrd proved their tenacity and resilience, capturing hard-fought wins in their respective divisions. In the Bojangles Late Model field, No. 97 Keith Bumgarner proved the car to beat, fending off charges from behind to take his second win in two weeks. Starting on the pole, Bumgarner pulled ahead of the field going unchallenged the first half of the race. Further back in fifth, No. 12 Austin McDaniel was determined to find the front, taking second on Lap 9 with No. 1 Pietro Fittipaldi settling in third. After two early cautions, McDaniel found the power to catch Bumgarner on Lap 22. The lead was short-lived, however, with Bumgarner returning the favor two laps later. After the lead changes, the field remained relatively quiet until a single car spin brought out the final caution of the race on Lap 32. Bumgarner took the high line on the restart, hanging on to the lead as cars shuffled behind him. No. 11 Matt Piercy made his moves late, gaining two positions on Lap 35 to pick up third. Fittipaldi followed suit, moving to fourth only to be challenged by No. 19 Kyle Moon until the last lap. Bumgarner took the checkered with McDaniel, Piercy, Fittipaldi and Moon rounding out the top five. A field of 25 cars led by No. 21 of Roger Pitts II made up the starting grid for the Paramount KIA Limited Late Models, promising fans a battle to the checkered flag. The crowd was not disappointed with the first caution falling on Lap 5 as three cars came to a stop in Turn 4. The top three drivers seized this opportunity to gain the lead on the restart, running three-wide on the backstretch. No. 55 Zach Bruenger came out with the lead as No. 51 Jeremy Pelfrey and Pitts settled in behind. Only a few laps later, Pitts made a determined run to the front, retaking the lead from Bruenger. The top two drivers battled it out the rest of the night, refusing to settle for second. This proved costly for Bruenger who was involved in the final caution on lap 34 as Pitts wheeled his was through unscathed. No. 7 Travis Byrd took advantage of the restart, powering by Pitts with two laps to go and taking the win. Pitts finished a hard-fought second with Pelfrey, No. 22 Dan Moore and No. 00 Shane Lee in the top five. In the remaining divisions, No. 9 Kevin Townsend drove unchallenged to take the WrenchRags Street Stock victory while No. 21 Todd Harrington did the same in the 4-Cylinders event. The Red Baron Renegades closed the night as No. 64 Darby Crouch outlasted the cautions and took home the trophy. 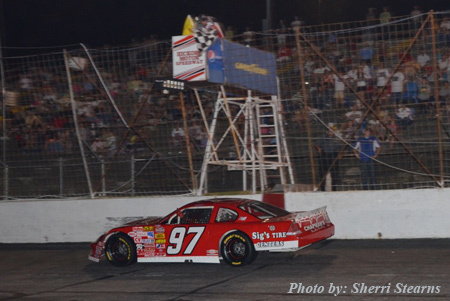 The NASCAR Whelen All-American Series returns to Hickory Motor Speedway on Saturday, June 30 th . Making appearances are the Bojangles Late Models, Paramount KIA Limited Late Models, WrenchRags Street Stocks, Super Trucks, Hobby Stock and Mini-Cups. Grandstands open at 5 p.m. with racing starting at 7 p.m.
9. (88) David Garbo Jr.